Landscaper Bob Sumien, a Catholic and Air Force veteran, works to restore the tribute. 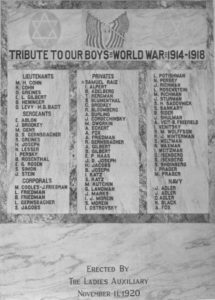 The marble tablets, etched with the names of 81 Jewish doughboys, impart lessons about monuments, memory and changing perceptions of the Great War waged a century ago. 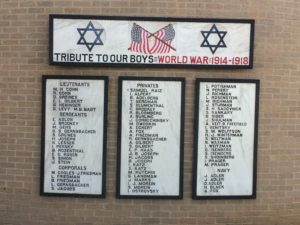 Unveiled in Fort Worth with fanfare on Armistice Day 1920, the 10-foot-tall, World War I Tribute To Our Boys was embedded in a lobby wall at the Hebrew Institute, a recreational and educational center that was part of Fort Worth’s Ahavath Sholom decades ago when the Jewish community was centered downtown on Taylor Street. The war memorial, with its two Stars of David and a pair of American flags, expressed ethnic pride in a patriotic context and added layers of meaning to the building. On April 1, Ahavath Sholom plans to invite families and descendants of the soldiers listed on the honor roll to a special Sabbath morning service. More than 20 of those listed have family or descendants living in Fort Worth. Yet in 1951 when the Hebrew Institute closed, there was no designated space for the monument in the synagogue that replaced it on Eighth Avenue. The honor roll was dismantled and its marble slabs stacked in a storage room. Forgotten for the next three decades, this piece of public art was rediscovered in the autumn of 1980 as the congregation readied to move into its next building at Hulen and Briarhaven. 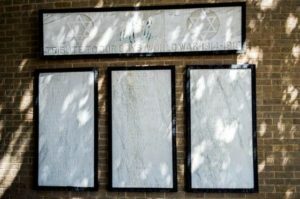 Overjoyed at the discovery, Building Chairman Al Sankary, whose father’s name is on the monument, opted to frame the four marble tablets and hang them in a landscaped courtyard at the entrance to the synagogue. Amid the excitement, no one realized that part of the original montage was missing — a fifth marble tablet inscribed with the name of its sponsors, the Ladies Auxiliary to the Hebrew Institute. Inexplicably, an element of community history acknowledging efforts of women on the homefront had disappeared. Nonetheless, the newly framed-and-arranged marble roster looked artistic and dignified in its outdoor setting. The veterans’ names, etched in black, were visible from afar: Adelberg, Cohn, Gernsbacher, Jacobs, Levy, Katz, Rosenthal, Sturman. Descendants of these soldiers still lived in Fort Worth. The monument conveyed continuity, l’dor vador, from generation to generation. But, with exposure to sun and rain, the dark ink highlighting each veteran’s name faded. In the past year, as America readied to commemorate the April centennial of the country’s entry into the First World War, the Fort Worth Jewish Archives began researching the soldiers named on the tablets. 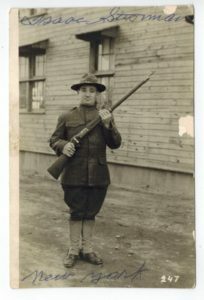 A call for World War I memorabilia reaped vintage photos of Pvt. Shady Sankary, Pvt. 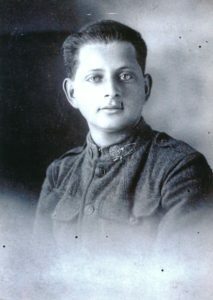 Eph Rosen, Sgt. 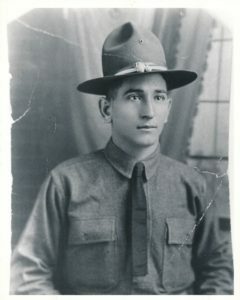 Byron Gernsbacher, Pvt. Sam Sheinberg, Pvt. Isaac Sturman, and others, along with mess kits, helmets, bayonets, binoculars and keepsakes. These are on display in special exhibits at Ahavath Sholom and Beth-El. 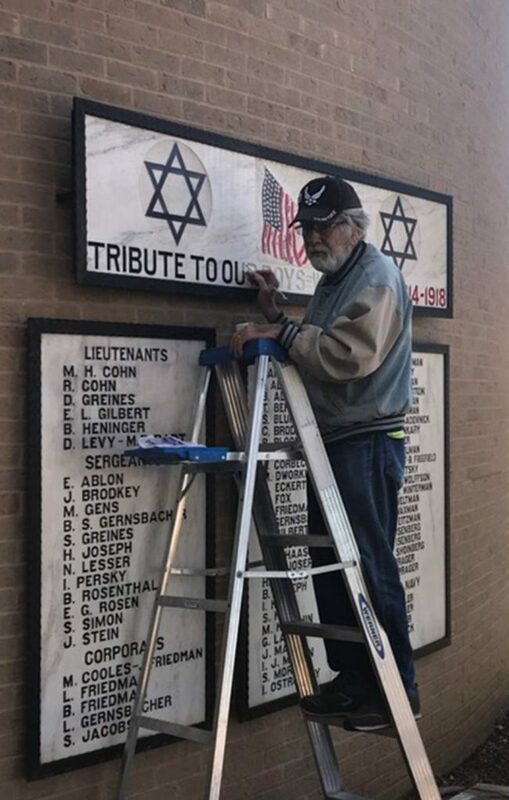 Most important, Ahavath Sholom’s landscaper and cemetery caretaker, Bob Sumien, a Catholic and an Air Force veteran, volunteered to restore the monument. Throughout the summer, fall and winter, he inked in the 81 names, installed lighting, and returned the marble honor roll to visibility. “They deserve it,” Sumien said, explaining why he and employees at his company, Professional Irrigation, spent countless hours bringing the memorial back to prominence. Many congregants have asked if this work of public art, with its red-white-and-blue flags and blue Magen Davids, is brand-new. At the Ahavath Sholom ceremony, Rabbi Andrew Bloom plans to call them to the bimah and lead memorial prayers in front of the honor roll. Ahavath Sholom’s doughboy monument has been added to the map of First World War sites created by the Texas and U.S. World War I Centennial Commissions. Art historian Mark Levitch, who is on a quest to inventory every World War I monument in America, has documented damaged, vandalized and crumbling statuary nationwide. He is pleased at the restoration work completed in Fort Worth. The Chai Force basketball dynasty was developed in recent years through the efforts of two local fathers, Dusty Eber and Dr. Arbe Cohen, to allow both shomer and non-shomer Shabbat kids to play competitive basketball together. The Chai Force basketball team held the first-ever Chai Force Shabbaton this past weekend. The weekend began with Friday night services and a beautiful dinner at the home of Rabbi Meir and Sarit Sabo, beloved teachers of many of the Chai Force kids at Akiba, who also have a son on the second-grade Chai Force team. As Israelis, the Sabos’ home is always open to the community and full of love, spirit and amazing food, and hosting the Chai Force boys was no different. Former Yavneh basketball superstar Gavi Wolk spoke to the kids at the Friday night Shabbat dinner about ambassadorship and sportsmanship on the court and about how we represent all Jews when we are on the court. For example, Wolk explained, when the Yavneh varsity boys traveled to Abilene recently for the state basketball championship, that may have been the first time people out there had experiences with Jews, highlighting the importance of displaying proper behavior both on and off the court for all to see. For the Friday overnight, Marni and Graeme Rael hosted about 10 seventh- and eighth-graders, Amy and Dusty Eber hosted about 10-15 sixth-graders, and Bat Sheva and Gary Schwartz hosted about 10-15 fifth-graders. Out of respect for the kids and host families that keep Shabbat, all participants were asked to refrain from using their cell phones from Friday drop-off to Saturday after Shabbat. 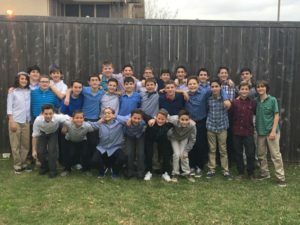 Although this may have seemed like a tall order at the outset, the togetherness of the Shabbat experience actually allowed the boys to unplug with very little effort. Saturday morning Shabbat services were held at Congregation Shaare Tefilla. Exemplifying the unity the group developed, Park Hill seventh-grade Chai Force player Micah Bernstein shared, “When we were all together saying the Shema arm in arm in a big circle, it didn’t matter where we were from, we were all one.” Following services, the Ebers hosted a giant Shabbat lunch for all participants. Yavneh junior varsity basketball coach Zach Pollak gave an inspiring talk to the boys at the Shabbat lunch about the two steps to becoming a great basketball player — persistence and resilience. Shabbat afternoon, the boys enjoyed a few hours of sports, activities and just hanging out. Shabbat ended with a spirited Havdallah service at the Eber home, led by Rabbi Sabo on vocals and Graeme Rael on the guitar. Once again, Rabbi Sabo could hardly contain his awe and Jewish pride upon seeing the boys arm in arm singing and bringing Shabbat to an end together. Eli Levine, a sixth-grade Chai Force player from Chandler Elementary who had not participated in a Shabbaton before, was given the honor of holding the Havdallah candle in the middle of the circle of 30 boys. The Chai Force philosophy is one of inclusion, where shomer and non-shomer kids play together in competitive basketball leagues at Sportsplex at Valley View, with a guarantee that no regular season or playoff games will take place on Shabbat, and no child is turned away due to skill level or for any other reason. For information on joining a Chai Force team, please contact Dusty Eber or Arbe Cohen at ChaiForce18@gmail.com. We prepare for Passover in many ways, from buying food to cleaning our kitchen. The most important preparation is telling the story. We have the story direct from the Torah and it is a great one with lots of action and wild plagues. We look to understand the why of the plagues and there is wonderful rabbinic insight. Moses is the hero of the Torah but there are also many other heroes. The women are amazing: the midwives Shifra and Puah, Yocheved (Moses’ mother), Miriam (sister), and Tziporah (wife). But the one we must hear about at our Passover Seder is the hero of the Red Sea Miracle — and it is not Moses. The rabbis teach us that liberation comes to the courageous. Nachshon was able to believe and have faith — he was willing to risk because he trusted. Rabbi Adam Greenwald, in a commentary on this parashah, suggests that a good name for the Israelites would be B’nai Nachshon, children of Nachshon. We are the children of the one who walked into the sea because he believed in a better life for himself and his children. After the sea opens and the children rush to the other side, they are free. But they still had miles and years to go before they reach the Promised Land. At our Passover Seder, we stop the telling after we reach freedom. This year, let us talk about what happens when the journey continues and how Nachshon made it possible. The first steps were taken long, long ago and we are still walking toward freedom thanks to Nachshon. Shalom… from the Shabbat Lady. Mazal Tov to Rabbi Ari Sunshine, who will serve as Congregation Shearith Israel’s next senior rabbi. 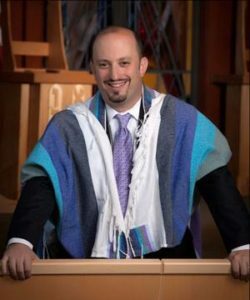 “It is with great pleasure and excitement that we announce Rabbi Ari Sunshine has been elected to serve as the next senior rabbi of Congregation Shearith Israel,” Congregation President Gail Mizrahi wrote in a letter to the Shearith community Thursday evening, March 23. After graduation from college, Rabbi Sunshine served three years at Temple Israel in Sharon, Massachusetts as youth director and senior USY adviser. In 1997, he decided to attend the Jewish Theological Seminary in New York. While attending JTS, he also served as a rabbinic intern for Beth El Congregation in Baltimore, Maryland, and for The American University in Washington, D.C. Rabbi Sunshine has extensive experience working at Camp Ramah in Ojai, California. 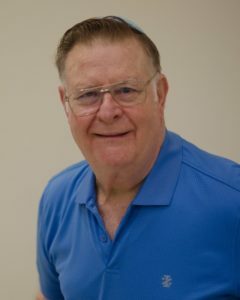 He staffed United Synagogue Youth on Wheels during the summer of 1995 and was a group leader for United Synagogue Youth Pilgrimage to Israel and Eastern Europe. Rabbi Ari Sunshine will assume the Shearith Israel pulpit in July. He received his M.A. and rabbinic ordination from the Jewish Theological Seminary in spring 2002. From July 2002 until November 2006, he served as the associate rabbi of Temple Israel in Charlotte, North Carolina. In November 2006 Rabbi Sunshine became the rabbi of B’nai Shalom of Olney, Maryland. Rabbi Sunshine currently serves as the president of the Greater Olney Interfaith Ministerium and as the president of the Washington-Baltimore Region of the Rabbinical Assembly. 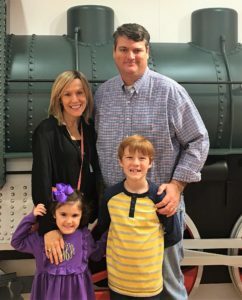 “We look forward to welcoming Rabbi Sunshine, his wife, Jennifer and their children, Jonah and Elana to our community this July,” said Mizrahi. The Congregation Beth Torah Men’s Club honored longtime member Dave Gerstein with its inaugural Lifetime Achievement Award at services Saturday, March 25. 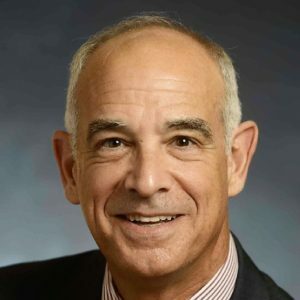 Gerstein is a former club president with decades of leadership roles on the regional and national levels of the Federation of Jewish Men’s Clubs, the umbrella organization for Men’s Clubs at Conservative synagogues throughout the United States and Canada. Rubinstein said the new Lifetime Achievement Award will be awarded periodically, and will be named for Gerstein. The Dallas Chapter of HaZamir performed last week in New York City at the Metropolitan Opera House with HaZamir choirs from around the country. Members of the local chapter are Emily Rosuck, Samantha Harberg, Jeffery Harberg and Hannah Fritts. They are conducted by Charles Owens. HaZamir is a project of the Zamir Choral Foundation, the only international organization dedicated to using Jewish choral music to foster Jewish identity across generational, denominational and political lines. Now, in their 24th year, the foundation’s achievements are remarkable in both music and Jewish education. HaZamir is a network of choral chapters for high-school-age singers. The choir is growing in name and popularity and has doubled in size in the past six years, with 29 chapters now in the U.S. and six chapters in Israel. HaZamir is not just a choir. It is also a dynamic and charismatic youth movement, offering participants a pluralistic environment in which to interact with other teens from all streams of Judaism. HaZamir singers learn Jewish choral repertoire as they build community, develop leadership skills, connect to Jewish culture, and receive a Jewish education. The concert featured the world premiere of FanFare for Jerusalem by award-winning New York pianist and composer, Randy Klein (http://www.randyklein.com/). Klein’s composition is based on excerpts from the Psalms of David. Klein, a self-professed secular Jew, says that the experience has been deeply meaningful. “It brought back the memory of the joy of being raised in a home that observed Jewish traditions. These memories had lain dormant for decades and now I was given the chance to feel them again as a mature adult.” You could interview Maestro Matthew Lazar and Randy Klein about their close collaboration on this piece. Klein, who does not speak or read Hebrew, based his composition on the Hebrew texts. On Saturday, April 29, Temple Shalom Sisterhood will present the 2017 Woman of Valor Award to Keo Strull. The award is presented annually to a Sisterhood member who has demonstrated the highest standard of community service, leadership and character. For 30 years, Temple Shalom Sisterhood has recognized an extraordinary group of women. Keo Strull embodies what it means to be a woman who uses her strength and power to improve the world. As an active volunteer for Temple Shalom and the community, she has worked tirelessly in numerous volunteer roles. In addition to Temple Shalom, Keo has served Southwest Jewish Congress, the JCC Maccabi Games and AJC. Keo never says “No!” She now serves as co-chair of Temple Shalom’s Connection Council, where she is responsible for all the committees that ensure prospective members and congregants are welcomed and integrated into Temple life. 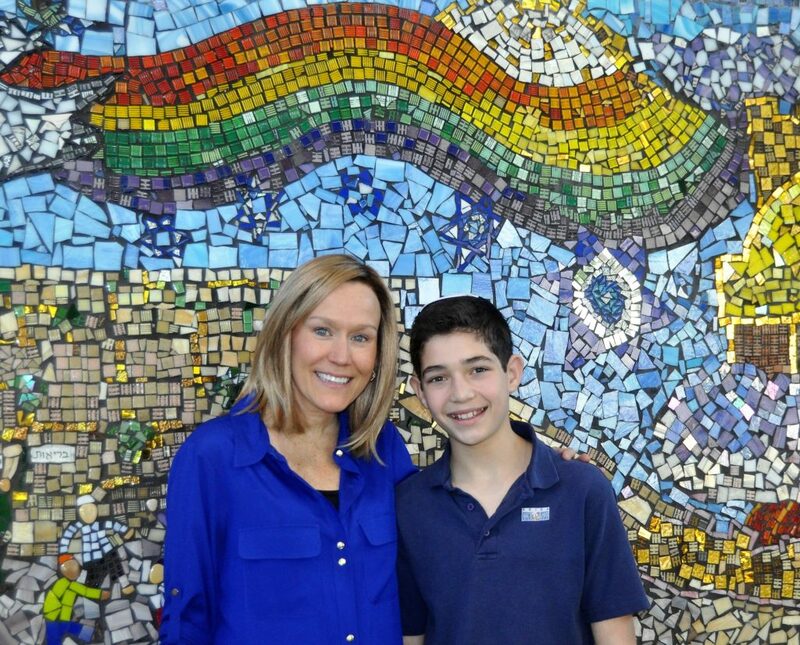 Keo’s generous spirit, enthusiasm and love for all things Jewish make her a standout honoree! Sisterhood is proud to sponsor a celebration in her honor. The Temple Shalom Sisterhood Spring Event, “Music Under the Moonlight” will begin at 6 p.m. at Temple Shalom, 6930 Alpha Rd, Dallas. The evening includes dinner, music featuring The Merseymen, a silent auction and cash bar. Tickets cost $75. Proceeds from the event will benefit Temple Shalom Sisterhood and Adaptive Training Foundation (ATF). ATF was founded by David Vobora, a 5-year veteran of the NFL, who was forced to leave his football career due to a devastating shoulder injury. 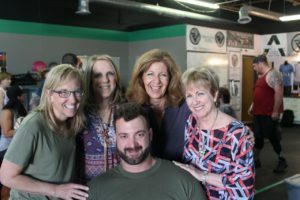 Now owner of a Dallas-based gym, David helps wounded veterans and individuals with life-altering physical challenges to find confidence, mobility and hope. ATF offers a nine-week intensive training program customized for each participant’s specific disabilities. Please help us support ATF, and their goal to empower individuals with disabilities. For sponsorship availability or more information, contact Event Chair Robyn Klein at whatsup290@yahoo.com or go to www.templeshalomdallas.org to buy tickets. The Texas A&M Corps of Cadets, along with AIPAC, Texas A&M Hillel, Jewish War Veterans of America and the Jewish Welfare Board, will host the first Jewish Warrior Weekend: Aggieland, April 14-16, in College Station. Sponsors hope it will become an annual event. The event, open to any Jewish ROTC or military cadet in the nation, including those from military academies and individual Jewish cadets from ROTC programs, will host a welcome from Brig. Gen. Joe Ramirez, the Commandant of the Corps of Cadets. Shabbat services and a kosher for Passover Shabbat dinner and evening will be held. Hillel and Shabbat morning services and lunch will be at Rohr Chabad Jewish Center. The weekend will include a campus tour, speakers on leadership, and a visit to the George Bush Presidential Library and Museum. Participants will be housed in dormitories. In addition to Shabbat dinner all meals will be kosher for Passover, and there is no charge for the Jewish Warrior Weekend beyond travel (and personal expenses). For those in need, there are travel subsidies available. Texas A&M Aggie cadets (left to right) Lt. Marc Wolf, USN (TAMU 2000); 2nd. 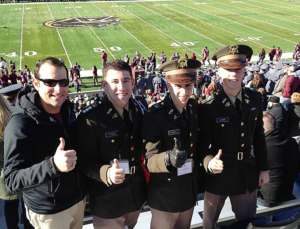 Lt. David Feibus (TAMU ‘15); Dan Rosenfield ‘17; and Wyatt Kamin ‘17 traveled to West Point for their Warrior Weekend, the impetus for the April 14-16 Jewish Warrior Weekend to take place in College Station. There is no charge for the weekend (other than travel and personal expenses), and travel subsidies are available. “We don’t want anyone unable to attend due to travel so I hope cadets will reach out to us as soon as possible so we can try to help,” said Rosenfield. He is coordinating the event with fellow Aggies Wyatt Kamin and Doug Mendelsohn, Texas A&M Hillel Executive Director and Campus Rabbi Matt Rosenberg and Project Advisor and Director of Fundraising, New York Region for the Navy Seal Foundation Marc Wolf (a 2000 A&M graduate). Upon graduation, Rosenfield will be commissioned as a Second Lieutenant and move to Ellsworth Air Force Base in South Dakota, pursuing a career in public affairs. Rabbi Rosenberg is proud of the involvement of the Jewish community at Texas A&M, albeit a small group of close to 200. 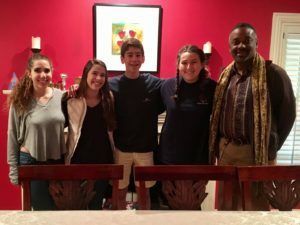 On a typical Friday night, between 40 and 50 Jewish participants will celebrate Shabbat together, with many calling Hillel “home,” spending many hours during the week for both study hours and socialization. Former Deputy Surgeon General Maj. Gen. David Rubenstein (U.S. Army, retired); Air Force Chaplain Maj. Sarah D. Schechter; and former U.S. Air Force Chief of Staff Gen. Norton A. Schwartz, USAF (retired) will address the cadets during their stay. Rubenstein is an A&M graduate returning for the program. Now clinical associate professor of health administration at Texas State University, Rubenstein recalls his time as a cadet from 1973 to 1977, as a positive experience where Hillel was active. Rubenstein will speak about being Jewish in the military, leading oneself in order to best lead others and how American Jewry has an impressive record defending the nation’s security. Schechter is the branch chief of plans and programs at the Air Force Academy. She is the rabbi and chaplain to the dean of faculty, and the first female rabbi in the Air Force. 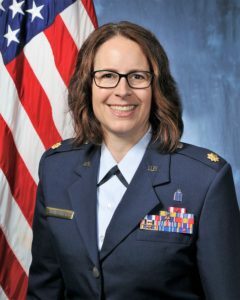 She directs the largest religious respect-training program in the Air Force, advises leadership and ensures the free exercise of religion for cadets and Academy personnel. 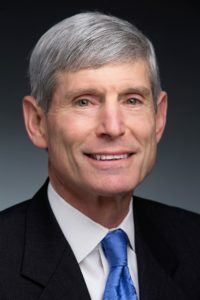 Schwartz has served for more than 40 years, during which he was the senior uniformed Air Force officer responsible for the organization, training and equipping of 680,000 active-duty forces serving in the United States and overseas, and was a member of the Joint Chiefs of Staff, functioning as military advisers to the Secretary of Defense, National Security Council and the president. For more information or to register, email JWWAggieland@gmail.com. Just about everyone enjoys going on a treasure hunt. 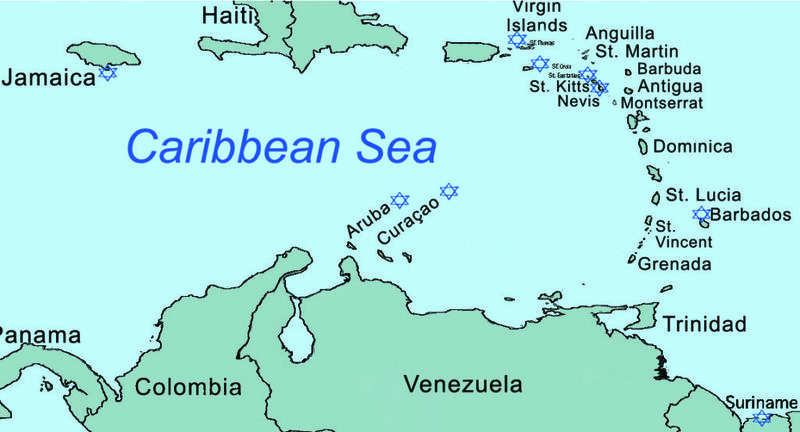 So if you’re Jewish and possibly thinking of a future cruise, why not plan a trip to the Caribbean which includes stops at one or more of nine Jewish “treasure” locations? As a result of the forced conversions and expulsion of Jews from Spain and Portugal starting in 1492, many Jewish families migrated to the new world of the Americas, searching for religious and economic freedom. My wife and I recently returned from a cruise which included a stop at one of those Caribbean islands of Jewish refuge. Originally colonized by Denmark, Saint Thomas was sold to the United States in 1917 for $25 million. Opting out of the cruise company’s excursions in St. Thomas, which included “swimming with the sharks” (who needs such excitement? ), we instead took a short cab ride to the front entrance of the beautiful St. Thomas Synagogue, rebuilt in 1833. Unlike our first visit many years ago when we found it open, but dark and unattended, there was a friendly and informative congregant-volunteer. The beautiful hanging lights were aglow as we received a very informative tour. Like our first visit, the floor was covered in sand. We were informed that the sand floor tended to muffle the voices, lessening the volume of interior sounds which might be heard outside the building. While in their little gift shop next door, I read a flier about a young photographer who was traveling the Caribbean, visiting and photographing locations of the earliest Jewish settlements, buildings and cemeteries, of which St. Thomas was one. I wished that our ship would also be visiting those other Jewish heritage sites, but no such luck. Instead, I would have to contend with doing the necessary research after we got back to Dallas. The book, Jewish Treasures of the Caribbean, The Legacy of Judaism in the New World, by Wyatt Gallery, is newly available at the Tycher Library at the Dallas JCC. The Jewish historical treasure locations can be found in Curacao, Aruba, Suriname, Barbados, Jamaica, Nevis, St. Thomas and St. Croix. Some of their cemeteries and structures are deteriorating and in need of care, protection and supervision. According to Wyatt Gallery, as evidenced by some of his photographs, a number of sites are deteriorating, are unsupervised because of a lack of Jewish residents, and — having no protection — are open to weathering, pollution, and possible vandalism. Before Jews came to colonial America, they pioneered and struggled to make a life in the New World. Take a look at Jewish life in the Caribbean by reading Wyatt Gallery’s excellent photographic history. It should have been a time for well-deserved rest and joyous reflection, returning home after a truly meaningful family occasion miles away. But when Malka Amster turned the key that opened the door to her Dallas apartment, she found it had been ransacked. Of course all her jewelry was gone. But she cried hardest over one item: a small gold ring, bearing the red and white stripes of the Polish flag overlaid with the initials P.C. — for Pola Cymrot. Her mother. A Holocaust survivor. “It wasn’t a particularly beautiful ring, or even valuable,” Malka told me. “But I always wore that ring when I needed something a little extra, a little more confidence, the feeling of being special.” She hadn’t needed any of that in Florida, where she had gone to meet her new grandson at his bris. All but one other of Pola Cymrot’s family were among the Nazis’ Polish victims. She grew up in the Warsaw orphanage of Dr. Janos Korczak, the Jewish author/pediatrician who ultimately died with his young charges in Treblinka. But before that, Pola had reached working age, so the Nazis moved her at 15 to make bombs in a munitions factory. Yet somehow she managed to hold on to her little signet ring. Malka’s grandson is named Elan Gavriel in memory of the uncle she never knew, her mother’s brother Elimelich. He was only 12 when Malka’s own grandmother, recognizing that all were surely doomed, allowed the boy to join a band of young people attempting an escape to Siberia. But somehow, he was lost in the woods, and no one could ever learn what happened to him. Passing time brings with it many challenges and changes. Malka had her own, although thankfully not like those of her mother. She came to Dallas four years ago to start a new life for herself, bringing many skills with her. A professional Jewish educator since 1978, when she became the University of Denver’s first Judaic studies graduate, she also studied with President Kennedy’s White House physician and has had a private muscle therapy practice since 1987. Additionally, she is a trainer of classical horses! As a newcomer to our city, “I decided to see some Jewish films,” Malka says. “I loved 3 Stars Jewish Cinema, and asked if I could volunteer.” Soon afterward, she accepted her current position as its managing director, which gives her the welcome opportunity to spread Jewish arts and culture more widely through an ever-increasing number of film showings. At the same time, using one of the six languages she speaks fluently, Malka also facilitates a Yiddish group at Shearith Israel. “One can never be prepared to come home to an apartment that has been burglarized, or the feeling of invasion and loss,” she said. She appeared on Fox 4, making a public “no questions asked” offer of $1,000 for return of the ring that survived all the horrors of the Holocaust, only to be stolen from a quiet Dallas apartment. No takers so far. Yet: “It’s the important things in life that can never be stolen,” Malka says, with philosophical resignation. Does she mean her new grandson? Her current satisfying activities? Her memories? She didn’t specify. And I didn’t ask. National Health Decisions Day is April 16, and on Sunday, March 19, the Advance Care Planning Committee of Fort Worth and Tarrant County contributed to this effort with “A Time to Act.” Seventy people showed up early to Beth-El Congregation to talk about the subject that no one wants to talk about: planning for the future if we are confronted with serious illness or trauma. Chaplain David Lowe from Baylor, Scott & White engaged and amused the crowd with his presentation focusing on the Advance Care Documents themselves, and why they are so important to complete. The big takeaway: Even if you have written documents, it doesn’t necessarily mean you have a plan. Having a plan means talking to your loved ones face to face so that they understand exactly what your wishes are, and making sure that they could verbalize those wishes back to you. 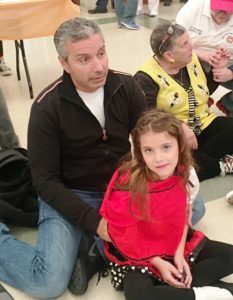 On March 12, Beth-El Congregation hosted Hamantaschen with Dads. 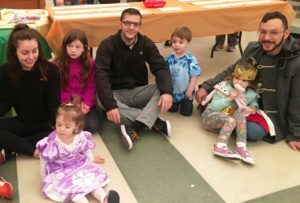 Dads enjoyed celebrating Purim with their kids at the festive event. Dr. Kendra Belfi, former president of the Coalition for Quality End of Life Care, helped define various life-sustaining treatments and their benefits and burdens, and dispelled some of the myths associated with those treatments. The takeaway here: Those treatments don’t always work as well as they do on television! And a representative from Lifegift, the organ donation center, gave us some staggering statistics about how many lives can be saved from one person’s donation alone. The participants also viewed several videos from the Jewish Theological Seminary, featuring different rabbis framing those medical interventions through the lens of Jewish law. 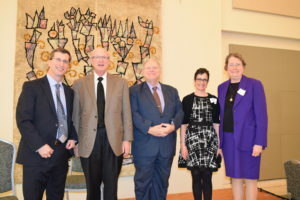 This was followed by a panel discussion with the guest speakers, as well as Rabbi Andrew Bloom from Congregation Ahavath Sholom, and Rabbi Ralph Mecklenburger of Beth-El Congregation. Everyone left armed with all the information and resources they needed in order to make informed decisions. And each received a Medical Power of Attorney form as well as a Living Will, to fill out after having these important conversations with their loved ones. Their mission upon leaving: Complete these documents by National Health Care Decisions Day! The “A Time to Act” resource guide is available online at the Jewish Federation website (http://bit.ly/2o2ijbX), so don’t delay. Mark April 16 as the day to give one of the greatest gifts you can pass on to your family: peace of mind and a plan! The idea that “it’s the thought that counts” couldn’t be more understated than in the expression of a thought that counts 5,354 times — and still is counting! 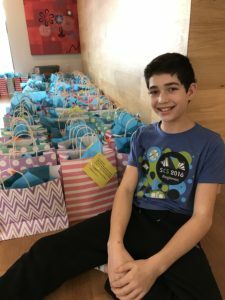 In just over three weeks Kim Hamilton Hunter’s Facebook post to find and say thank you to 13-year-old Ari Blumberg has been counted — and, at press time liked, loved, or otherwise shared by 2,662 people, and with more than 627 comments — his original mitzvah propelled around the globe. 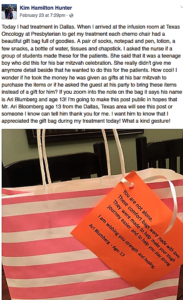 “I’m going to make this post public in hopes that Mr. Ari (Blumberg) age 13 from the Dallas, Texas area will see this post or someone I know can tell him thank you for me. I want him to know that I appreciated the gift bag during my treatment today! What a kind gesture!,” posted Kim, who, for a gift bag she received, created the thank-you note, and a search for her own local hero, now gone viral. 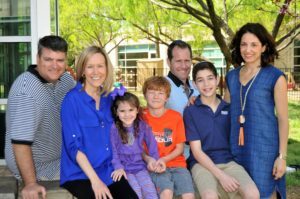 It was when Kim walked into Texas Oncology-Presbyterian Cancer Center Dallas that her heart first swelled due to the kindness of a stranger. Kim, who is battling metastatic breast cancer which spread to her bones before diagnosis five years ago, makes a monthly, four-hour and 250-mile-plus trek from her home in San Angelo for what she calls “liquid gold,” treatments. She presumed her regular seat was occupied by another patient when she saw a bag on her chair. There were bags on the next seat and the next so she returned to her chair for treatment, receiving the gift from an unknown heart. That heart belonged to Ari who wanted to contribute to others — like his Saba (Hebrew for grandfather) Mike Degani — who were receiving chemotherapy treatments. Knowing his grandfather’s trials, Ari wanted to do anything possible to let patients know someone was thinking about them. Ari hand-delivered almost 30 of the 120 bags made to patients, while leaving the rest for later appointments. He received a number of personal thank-yous from recipients. 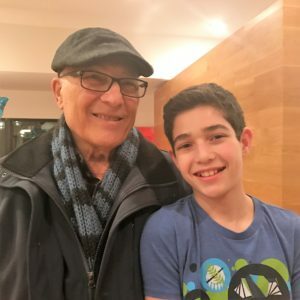 It took less than 24 hours — and shares and comments from throughout the United States, Israel and beyond — for Kim to connect with Ari, a seventh-grade student at Akiba Academy, the son of Sharon and Marc Blumberg, and brother of Sam and Ayla. In her Facebook response to Kim’s plea, Sharon explained how she and Ari had delivered the bags the day before while her father was having treatment, also including in her post a photo of Ari and his grandfather. Rabbi Ariel Rackovsky was honored that it was he bestowing blessings over Ari’s bar mitzvah, proud of the young man who spent a year studying to read all of the Torah readings during his service, and proud of the young man who clearly understands the concept of the responsibilities now set before him. It may be Ari’s original thought that counts, but it is through his new friend Kim’s push that others know his goodness, and her affinity for him and the Jewish people as a whole keeps getting the counts over and over again. 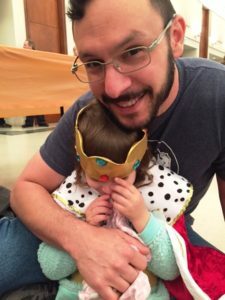 With all the likes and shares, Ari’s story was also shared by JewInTheCity.com and HumansOfJudaism.com. “I’m not Jewish but I learn Bible and the Old Testament with a friend and I spoke with our pastor’s wife for direction. I’d recently spoken with someone who was raised Jewish who had been talking about how to support Israel and stand with the Jewish community,” Kim said. That “strength and healing” will soon be something Ari can give through a hug and his in-person charming and genuine smile.